This continues my series of closer looks at the seven areas I think can bring the 103 (now 104?) month economic expansion in the US to an end. The previous articles are here (overview) and here (interest rates). Since the onset of QE (Quantitative Easing), also known as the printing of money, by the US, the UK, ECB, BoJ and others in the wake of the Global Financial Crisis, there have been dire warnings that this "new" money would create out-of-control inflation. We have yet to see that, but we will. TARP poured $700 billion into failing banks to prop up the economy, with too much of it ending up as bonuses in the pockets of the very bankers who almost killed their banks, and the economy with them. The FED then created $3.7 trillion more in QE . In Europe, the BoE created £375 billion more, and the ECB has bought €1.1 trillion in assets through the course of their Quantitative Easing (QE) programme. Much of that money sent to major banks or corporations. The banks were able to take advantage of "cheap money" to rebuild their balance sheets and solvency margins, by passing on only a limited amount of the reduced borrowing costs of Fed (or ECB or BoE) money. In his Bank Performance Outlook for 2018, Chris Whalen points out the "Fed is still effectively transferring $80 billion per quarter from depositors to banks." Additional stimulus has flowed into global economies in the form of budget deficits piling on debt to record levels. Yet still there is no meaningful inflation, and central banks continue to lament their failure to reach the vaunted 2% level. Where is the inflation, and will there be an inflation shock? Spoiler alert, yes, but from wages and probably not from the cost of goods and services, although the recent announcement of tariffs may push inflation expectations in other areas. First, we need to remember what inflation is, and why it occurs. Inflation is the general increase in the cost of goods and services across an economy, or the devaluation of a currency and the associated resetting of the costs of goods and services in that currency. We are told that inflation is caused by an increase in money supply over the increase in the supply of desired goods or services. Where there are too few mangoes (for example) and a high demand for mangoes, the price of mangoes will go up - inflation and good old fashion "supply and demand". We cannot doubt that there has been significant increase in the supply of money over the past decade. M2 in the US, has almost doubled in the past 10 years, from under $8000 (billions) to just under$14000 (billions). 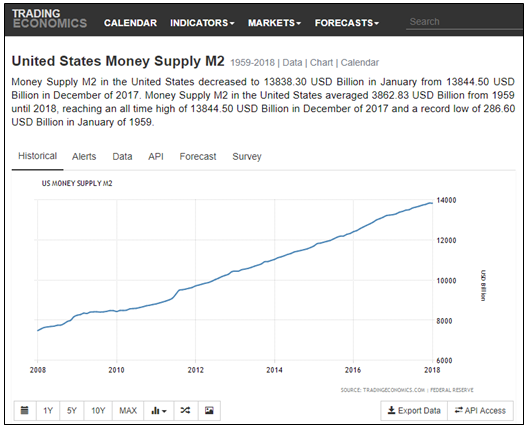 As a reminder, "M2 is a measure of the money supply that includes all elements of M1 as well as "near money." M1 includes cash and checking deposits, while near money refers to savings deposits, money market securities, mutual funds and other time deposits.". Strangely that almost doubling of the money supply has not resulted in inflation in the average cost of goods and services. 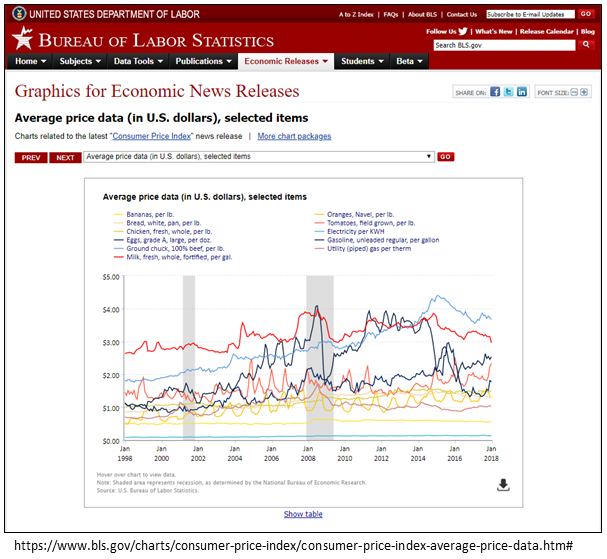 Looking at the BLS (Bureau of Labor Statistics) there appears to have been embarrassingly low inflation over the past 20 years. One inflation calculator puts total inflation between 2008 and 2018 at 13.7%, or in dollars, it will cost $113.70 today to purchase what would have cost $100.00 in 2008. 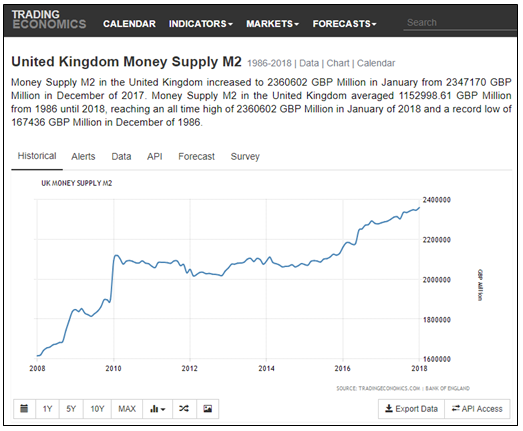 The same money supply and inflation sites tells us that UK money supply, UK M2, has increased by 50% in the past decade, while we are told that inflation has been a "brisk" 29.4% over that decade. 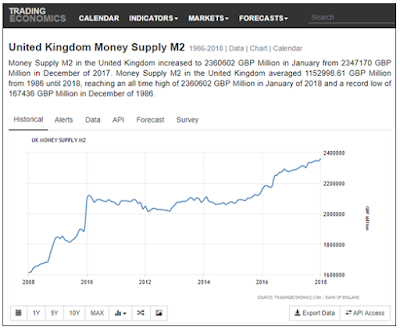 So while the money supply has grown from £1600 (billions) to £2400 (billions), it "only" costs £129.40 to purchase today what would have cost £100.00 in 2008. Certainly the housing market in the UK has been on a multi-year boom, at least in and around London, and in the almost continually expanding London commuter belt. Property price inflation outside of the London catchment has been muted at best, and has artificially moderated the national average inflation. 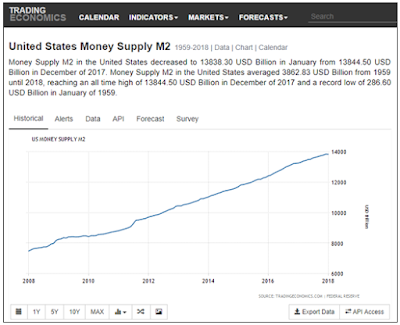 So if inflation is the result of money supply growing faster than the supply of good and services, then where is the money going, and what does that tell us about what might happen? We then need to consider a key attribute of inflation; not all goods, service or assets increase in price equally. The first set of US inflation data that I shared above seem to tell us that inflation is under control, or in fact not under control at all, if there is a target of 2% inflation. 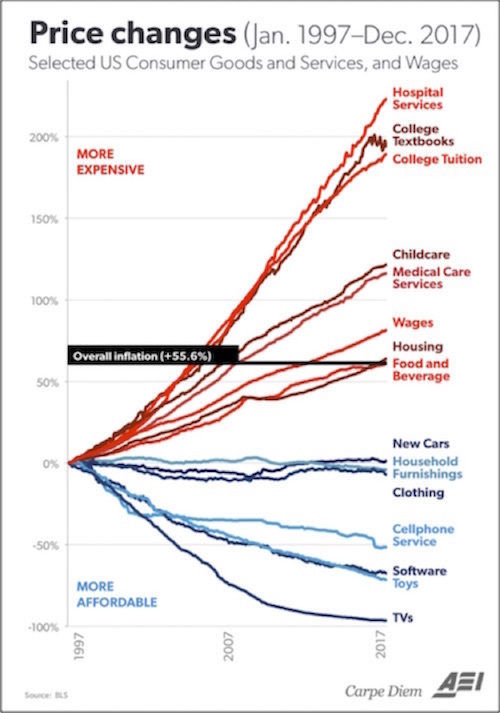 But over at the American Enterprise Institute, they have a chart that shows inflation broken out quite differently, and they should a roughly 55% inflation over the past twenty years. John Mauldin uses this table in his recent "thoughts from the Frontlines" on 3 March 2018. What is so interesting about this chart is that the elements that link to a higher standard of living and higher potential income are the elements that are rising the fastest. While it also shows that wages have increased at a rate faster than inflation, there is ample evidence that such wage growth has been skewed to the higher income earners. It shows healthcare and education growing at well over 100%, and far outpacing most other goods and services. These are the two key areas where potential impact on future standard of living are felt the strongest. Education directly contributes to an individual’s ability to find and retain higher paying work, and without that higher paying work, healthcare becomes less and less affordable. Without good healthcare, and the economic capacity to purchase quality healthcare, the ability to continue to earn at any level of income is impaired. Which leads back to the original question; will an inflation shock kill the markets? Not the inflation we have been seeing. The markets do not, and will not care about inflation in costs of goods and services that upper income earners consume. The increases, while nose-bleed levels for some goods and services, the incomes of consumers of those goods and services have risen at pace. This is not where the shock will come from. Inflation in almost all other categories has been constant, but as the BLS numbers show in the earlier graph, there has been little inflation in most goods and services. Fundamentally this is because there has been no shortages in those areas, and therefore no supply and demand need for costs to inflate. However, the market "correction in February has already shown us what inflation can do, when that inflation is in the form of increased wages, when that increase is in lower and middle income wages, not those at the top. We can expect more. If inflation is too much money chasing too little of a given resource, then the low unemployment rates in the US today, if you believe the 4.1% number reported by the BLS for January 2018, is that "too little" resource. Wages will need to increase to attract that resource, reducing future expected incomes for employers. The name of the business function has said it all for the past few decades: Human Resources. Resources just like copper and wood, cash, electricity and fuel. Humans are now a commodity, and have been for decades, and that commodity price is about to rise. Inflation in the cost of this now theoretically scare "resource" will push up prices across the board. 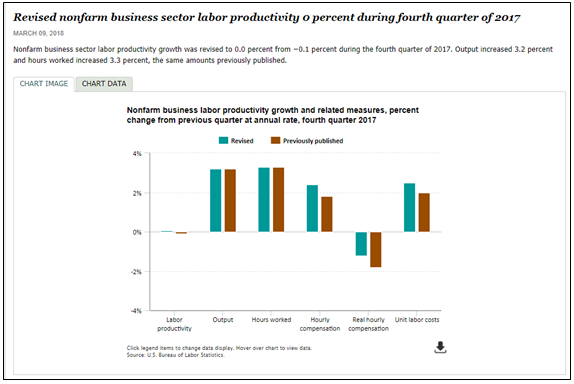 Fourth Quarter 2017 (US) numbers should give us any comfort, with Productivity growth at 0%, yet Labor Unit Costs and Hourly Wages both being revised upward. This is not sustainable without real wage inflation, and inflation moving beyond the human commodity and into the wider economy. These number tells us that we should expect lower corporate profitability, lower free cash, and lower expected returns in appreciation of already overpriced shares. So watch the monthly unemployment rate (with ADP projecting a 235,000 increase in payrolls for February 2018) and an announced 313,000 BLS-reported increase for February, and watch the wage data from the BLS. These two provide an indicator of future inflation in the one major commodity area where the only way to "mine" new resources is to pay a higher price. The mangoes in case are humans, and there are not enough to go around. This means the mangoes (humans) will cost more - the classic definition of inflation, and the warning of problems to come across the economy. Next week I aim to tackle another of the seven areas that could kill this recovery.